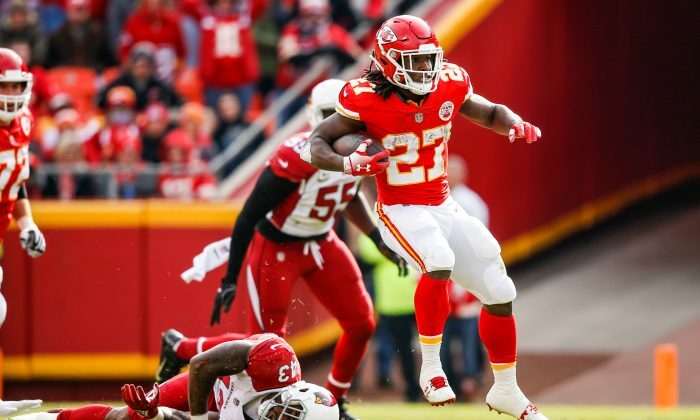 Kansas City Chiefs running back Kareem Hunt was filmed allegedly kicking and pushing a woman in a video posted by TMZ and other news outlets. Hunt pushed the woman, 19, at an Ohio hotel in a February 2018 incident that was just made public. The Kansas City Chiefs Kareem Hunt caught on video brutalizing and kicking woman. Someone can be seen trying to restrain Hunt, who weighs 201 pounds, before the woman hits him in the face, sending him into a fit of rage. The Chiefs star then turns the corner and runs into a man, who hits the woman, sending both to the floor. Hunt then kicks the woman in the leg, the video shows. Abigail Ottinger, of Middleburg Heights, Ohio, told police that Hunt assaulted her at around 3:45 a.m. in The Metropolitan hotel in Cleveland, according to the Cleveland Plain Dealer. Another woman who was with Hunt said he assaulted her. Law enforcement sources obtained the video from The Metropolitan and sent it to prosecutors. He was not charged by prosecutors, but one police report listed Hunt as a suspect while another one listed Ottinger as a suspect. Cleveland police spokeswoman Jennifer Ciaccia told the Plain Dealer that the incident appears to be a cross-complaint, which means each person would be directed to the prosecutor’s office if they wanted to pursue charges. When they were called to the hotel, police didn’t arrest Hunt at the time and no charges were filed after officers said they weren’t able to figure out if a crime was committed, according to TMZ, which also posted body camera footage of officers interviewing Hunt and his accuser. On Nov. 30, the Chiefs excused Hunt from practice after the video was released, ESPN reported. In August 2018, Hunt spoke of the reports and in another incident where he was accused of punching a man. He said he had “learned from it” and wanted to focus on playing football. Chiefs owner Clark Hunt issued a statement at the time about the reports. It’s not clear what will happen to Hunt now that the video is released. The team hasn’t issued a statement about the matter, and it’s not clear if Hunt will play on in the Chiefs’ next game against the Oakland Raiders on Sunday. The NFL hasn’t issued a comment, either. Hunt said he doesn’t expect the NFL to punish Hunt. Andy Reid, the Chiefs coach, also said he had spoken with Hunt following the incident. In 2017, Hunt led the NFL in rushing yards and was selected to the Pro Bowl. In 2014, former Baltimore Ravens running back Ray Rice was videotaped knocking out his then-fiancée in a hotel elevator. He was suspended by the NFL after TMZ released the video. And in 2017, Dallas Cowboys running back Ezekiel Elliott received a 6-game suspension from the league over allegations that he assaulted his former girlfriend in 2016. Elliott, however, has categorically denied Tiffany Thompson’s claims. He wasn’t arrested or charged in connection with the incident.